Incorporate feng shui to energize your team. If you're wondering how feng shui can improve your work environment, this feng shui for the conference room interview takes some of the mystery out of it. If your goal is to energize the conference room, these helpful feng shui tips can be immediately applied to your office. Do you believe your business's bottom line can be improved simply by the way you arrange your work space? Pat Heydlauff certainly does. Heydlauff is the resident feng shui expert and president of Energy Design, a feng shui consulting firm that helps businesses create balanced and harmonious work spaces that promote productivity and reduce employee turnover. She's also the author of Feng Shui: So Easy a Child Can Do It, a book that shows how to use various small adjustments within your spaces to improve both your personal and professional outlook for greater success. LoveToKnow took the opportunity to speak with Pat Heydlauff specifically about how to use feng shui for the conference room. LTK: Pat, first of all, thank you for being willing to share your expertise with LTK's readers. When it comes to using feng shui in a business setting, how does a company actually go about determining the best placement of their conference room within an overall office layout? PH: If good energy does not enter the front door of a company and the business is full of clutter, it matters a lot less difference where the conference room is located because the much needed new energy will never reach that room. Therefore, the best way to determine the location a conference room is to first make sure the entrance to the business is clutter-free and has a welcoming appearance with something like colorful planters or small potted trees to encourage the positive energy to enter the business. Once that's accomplished, there needs to be a clear and easy to follow path available to lead energy to the conference room. Providing these areas are properly uncluttered and energized, the best location for the conference room is in the east area of the company. This is the area that always gives birth to new ideas, new thinking and growth energy. LTK: Now let's talk about the arrangement of the room itself. Even though there are a lot of variables to consider when incorporating feng shui into a specific space, is there a basic conference room layout people can use to get started? PH: Conference rooms should be kept somewhat simple with little wall décor to clutter the minds of those participating in meetings. A picture of magnificent trees on the east wall further energizes the "new" thought process and the west wall is the best location for some type of audio/video screens, grease boards and any other type of materials needed for creativity. The person in charge of the meeting taking place in the conference room should always sit in the chair at the head of the table opposite or diagonally across from the door. This helps that person benefit from the energy flow without being directly in its path, something that could interfere with his or her concentration. LTK: It's said that the type of furniture used within the conference room also affects the flow of chi. Which type of table and chairs are best used and how do their shapes affect the energy flow? PH: A wooden oval or round table best serves the energy requirements of the room because avoiding sharp edges and incorporating the wood element promotes growth, new ideas and new business. The gently curved shape of the oval or circle helps reduce negative chi in the room. The chairs, while comfortable, should not be so comfortable that no work is accomplished or participants linger after meetings. The service of food and beverages should be limited or be non-existent except for water so they don't distract meeting participants. The exception would be a working lunch. This room needs to be dedicated to creativity, productivity and problem solving, not for food and hashing over failures of the past or things that never materialized from previous meetings. LTK: Does the flooring in the room have any bearing on its energy? PH: The flooring can be of any material appropriate to and matching the remainder of the office area. It needs to match so energy will not stop before entering and move right past rather than through the door. The best colors are neutrals such as earth tones for the purpose of grounding the energy of the room and creating fertile energy. LTK: How important is color in the conference room, and which colors are most beneficial for promoting an atmosphere of creativity and productive discussion? PH: Color is actually very important in all areas of a company. In the conference room, the two best colors to use are soft green and pastel terra cotta. The green further emphasizes the "new" concept and the pastel terra cotta energizes relationships. This includes relationships between the people participating in the meeting as well as relationships with non-company people like clients, the press and negative thinkers. 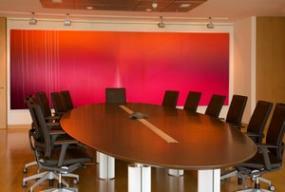 LTK: Which type of lighting will most benefit the personal chi of people using the conference room during meetings? PH: Wherever possible, full spectrum lighting should be used because it is most like nature and lends itself into the natural growth of things, including ideas. LTK: Do the electronic components often found in meeting rooms, such as computers, copiers, etc., affect the overall energy in the room? What, if any, remedies are required? PH: Yes, they can. The first option would be to limit or eliminate the use of permanent computers and technological equipment from conference rooms altogether. With laptops so readily available, they would be a much better energetic option for getting the job done with the least amount of impact. Laptops can be connected to a limited amount of existing equipment for PowerPoint style presentations and videos. However, if there is a lot of equipment already in the room and teleconferencing is a common practice, the west and northwest areas are the best place to locate the equipment because they properly energize the metal elements found in those areas, supporting creativity and helpful people. LTK: That's a lot of good information to help companies begin evaluating the energy of this particular work space. Is there anything else about using feng shui for a conference room that you'd like to pass on to our LoveToKnow readers? PH: Yes. Always keep in mind that, ideally, conference rooms should be designed to generate and create the future for a company and resolve issues from ongoing practices. They should not be used as employee lunch rooms, break rooms or a place to do casual business. Wherever possible, the conference room should be dedicated to company growth and focus on taking care of business. That way, employees will always know what to expect when they enter that room and how to behave appropriately to make meetings as fruitful as possible. LoveToKnow would like to extend thanks to Pat Heydlauff for her participation in this feng shui for the conference room interview. Anyone interested in more information or contacting Pat can visit her website.